Chief Kurt Bluder announced today the promotion of Shanon Gillette to the position of Deputy Chief of Administration for the Downers Grove Police Department. 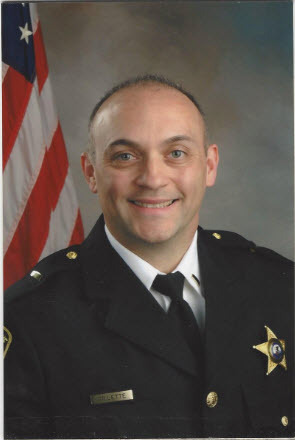 Gillette has been a police officer for the Village of Downers Grove for 22 years. He holds a Master of Science in Public Safety Administration from Lewis University, and a Bachelor of Arts in Management from Benedictine University. In 2008, he graduated from Northwestern University's School of Police Staff and Command, where he received the Center for Public Safety's Franklin M. Kreml Leadership award. Throughout his career Deputy Chief Gillette has served in a variety of leadership roles including Community-Oriented Policing Officer, Field Training Officer, Detective, Patrol Sergeant, Administrative Sergeant, Lieutenant of Operations, Lieutenant of Investigations, and Deputy Emergency Management Coordinator. "His strong work ethic, innovative thinking and excellent organizational skills will enable him to succeed as Deputy Chief," stated Chief Bluder. partnerships that promote transparency with the citizens we serve," stated Deputy Chief Gillette. Detective April Clarke will be promoted to the rank of Sergeant. "Both Lieutenant Harrison and Sergeant Clarke bring a wealth of knowledge to their new positions. I look forward to working closely with all three individuals and watching them grow into their new roles," stated Chief Bluder. All promotions are effective Sunday, December 20, 2015.